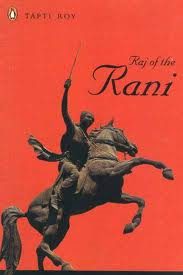 This book of Tapti Roy deals with the life of a warrior queen from history – Rani Lakshmibai , who was a figure in the gallery of heroes of the ‘First war of Independence’. Apart from the descriptive events of the freedom struggle,the book also presents the life of common man during the time of British rule in India.It is more than a fiction,realistic more than being dramatic in language.This book deals with the different phases of Rani Lakshmibai’s life – transition from Manikarnika (daughter of Moropant Tambe) to Rani Lakshmibai,queen of Lhansi is depicted very clearly.The life of energetic,vivacious and brave child, brilliant and expert queen is being presented with different versions of same story. As the information is collected from reliable sources, it is a good source of reference too.It salutes the valour of the nation’s heroes who sacrificed their lives to provide the freedom we enjoy today.It presents the chain of historic events which ultimately led to the freedom.We feel the patriotism while reading each and every line of this book and it honours this brave woman who found out her place in history.